It doesn't hurt to smile! Smiling connects people and soothes the soul – at home as well as abroad. Always try to be polite, friendly and patient, even in case of problems. Don't raise your voice. Just like at home, it will get you nowhere, but will poison the atmosphere and make you lose your face. Having some command of the English language helps a lot – don't be afraid of speaking it! When travelling to Latin America, you should at least know some basic Spanish words and in numerous regions in Africa it helps to know some French. There are many countries with dozens of languages. It's fascinating to learn less globalised languages, especially if you want to get to know locals and the country more intensively. You should at least know the commonly used words and gestures in the country you are visiting to say "Hello", "Goodbye" and "Thank you". Remember that there are countries in which "Thank you" is not said very frequently. Sometimes it is sufficient to smile or nod. On http://journals.worldnomads.com/language-guides you can download a translation app for your smartphone. It provides important words in different languages from Arabic and Khmer to Swahili and includes audio files to practise the correct pronunciation. Including second language speakers, 1.5 billion people speak English which is geographically the widest spread language. Linguistic diversity by regions: All in all, there are more than 7,100 spoken languages around the world. 2,146 (30.2 %) of these are spoken in Africa, 1,060 (14.9 %) in America, 2,304 (32.4 %) in Asia and 1,311 (18.5 %) in the Pacific region. 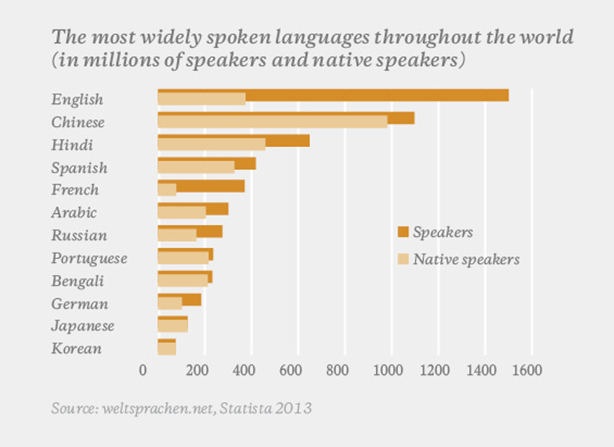 With 284 languages, Europe only makes up 4 % of the living languages. 6 % of all languages are spoken by 94 % of the world population. By contrast, 94 % of the languages of the world are spoken by only 6 % of the world population. Spanish is spoken in 31 countries, amongst others in all Latin American countries with the exception of Brazil (where many people understand it, though). French helps to communicate in many African countries, in eastern Canada and partially in Cambodia, Vietnam and Laos. Portuguese isn't only the official language in Portugal and Brazil, but also in several former colonies in Africa and Asia, for example in Cape Verde and Mozambique. About 3,000 languages of the world's 7,100 official languages are endangered. Many of those are increasingly replaced by predominant languages, used less and less and not taught to the next generations. Globalised tourism also has a share in this development.